"We have to adapt to the impacts that, unfortunately, we can no longer avoid", said President Obama at the UN Climate Summit in September 2014. Adaptation and resilience are now a must in both academic research and international bodies. A fashionable concept, resilience's polysemy sparks many debates on its uses and operational relevance. This book bridges the increasing divide between academic research and the latest planning innovations, offering practical and conceptual insights for practitioners, researchers and students. 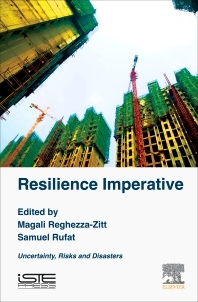 Magali Reghezza-Zitt and Samuel Rufat present a cross-disciplinary, state-of-the-art debate and critical analysis of the social, spatial, practical and political implications of resilience. I.1 Resilience, polysemy, cacophony or quandary? 2.1 One or several vulnerabilities? 11.3 “Good” or “bad”, who is declaring resilience?